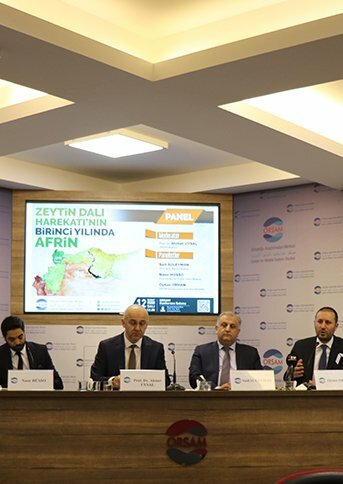 The Center for Middle Eastern Studies (ORSAM) organized a panel titled, “Afrin on the First Anniversary of the Operation of Olive Branch” on 12 February 2019. 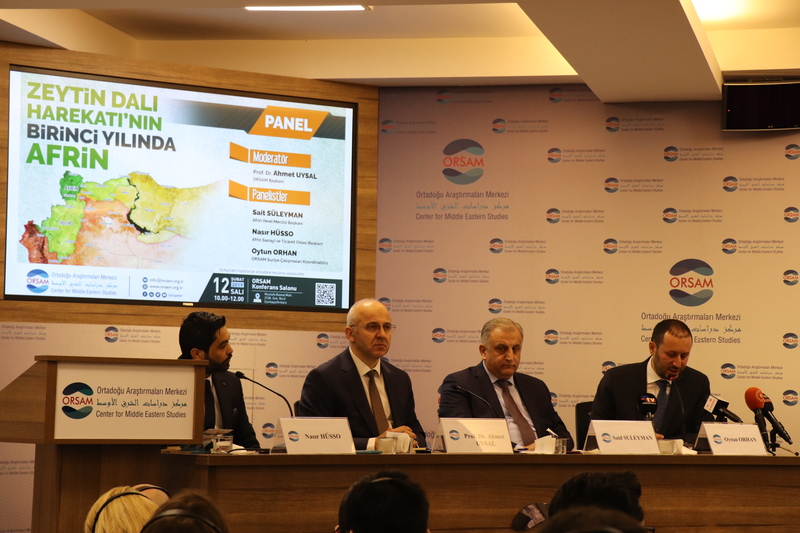 In the panel moderated by ORSAM President Prof. Dr. Ahmet Uysal, Sait Suleiman, the head of Afrin Local Council, Nasir Husso, head of Afrin Chamber of Industry and Commerce, and Oytun Orhan, ORSAM Syrian Studies Coordinator, were present as the speakers. 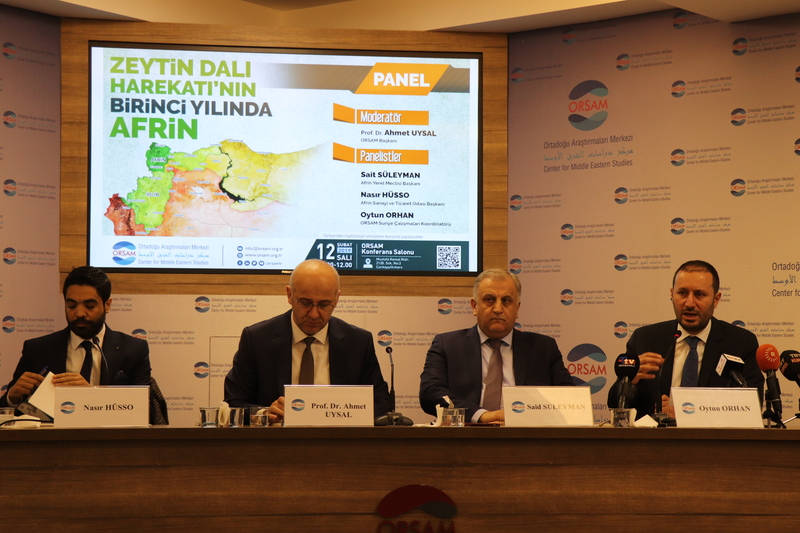 Taking the floor firstly, ORSAM Syrian Studies Coordinator Oytun Orhan evaluated Afrin from the perspective of Turkey, and analyzed the military and political implications of the Operation of Olive Branch for the Syrian civil war. Enumerating the goals Turkey tried to achieve through the Operation of Olive Branch, Orhan stated that the very first aim of the operation was to eliminate the territorial control of YPG. Secondly, all militants of the YPG were intended to be eliminated or forced to leave the region, and in this context, more than 4,000 YPG militants were eliminated and a remarkable number of militants escaped from Afrin to Tell Rifaat and Manbij. Finally, Orhan mentioned that the aim is to eliminate the political and administrative structure of YPG in Afrin and establish a structure based on local dynamics. Orhan concluded that through the Operation of Olive Branch all these goals had been achieved. Referring to the military and political implications of the Operation of the Olive Branch, Oytun Orhan stated that this military operation also shed light to the success of the Turkish army in the cross-border operations and FSA’s position in the balance of power among other non-state actors in Syria. Stating that the most important military result of the Operation of the Olive Branch is that the local power that receives air support behind it guarantees the success in the field to a great extent, Orhan said that this operation revealed how YPG performed without air support. He stated that the argument that the only effective actor in the fight against Daesh is YPG has also been invalidated by this operation. 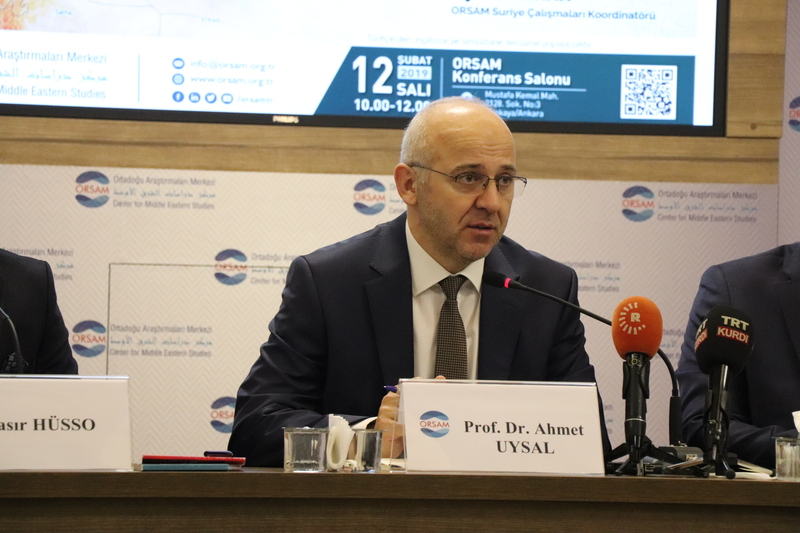 Oytun Orhan argued that the claims that YPG did not actually show much resistance were not true, that the Turkish army faced significant resistance on the border line, and that the outside logistic support lines of the organization were open. As a political result of the Operation of the Olive Branch, he explained, Afrin is one of the strongholds of YPG, which are of emotional importance for the YPG and the PKK, and thus the loss of this region could be the beginning of the end for the YPG in Syria, and it would be difficult for the organization to survive in other areas where the YPG, which could not prove to be resisting that much in Afrin, is much weaker. Orhan stated that YPG had lost territory for the first time in the wake of this operation and that the “immunity” armor on YPG had been removed. After the Olive Branch, he stated that the YPG plan to form a political structure on the Syria-Turkey border line came to an end. As a result of this operation in terms of Turkey, he added, the geographical link between Idlib and Euphrates Shield was ensured, new living space was provided to the opposition, and that the PKK was denied an opportunity of penetration into Hatay through Afrin. After evaluating the current situation in the region following the Operation of the Olive Branch, Orhan stated that the security in the district has not yet been fully achieved and the PKK/YPG actions are still continuing. However, he also added that some of the actions of FSA are criticized in the international arena and the illegal actions of the FSA members are arrested by Turkey. 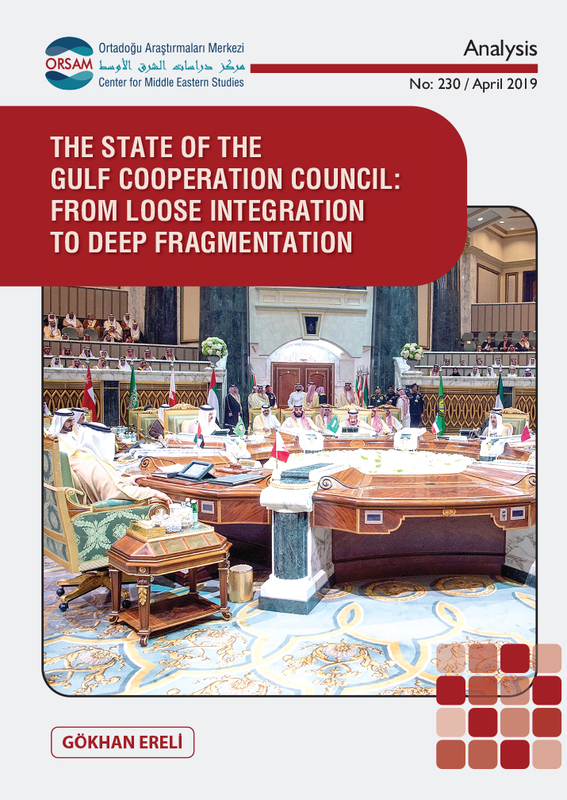 In addition, he specified that the region needs investment and that the infrastructure is insufficient. Moreover, he stated that the people who are made leave Deraa and Eastern Ghouta as a result of the ceasefire agreements in these regions are sent to the Turkey-controlled regions and a part of this population has been settled in Afrin, which in turn has created pressure in the region. 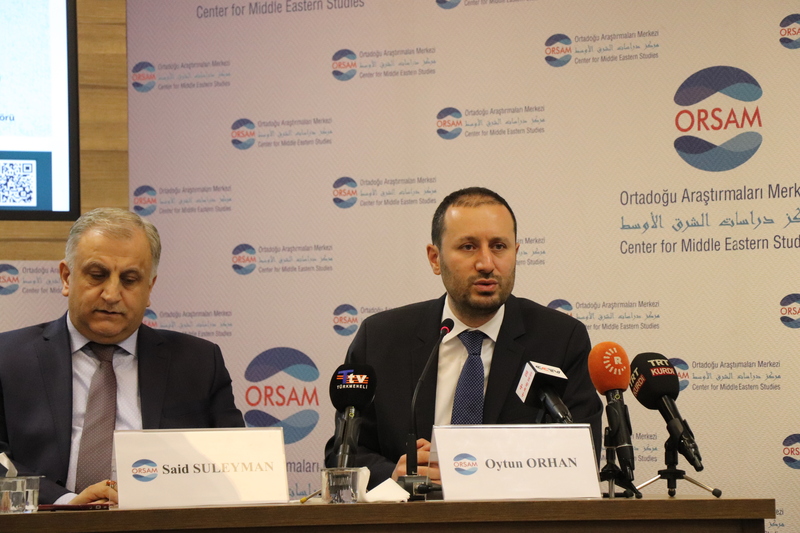 Orhan concluded his speech with the risks concerning the future of Afrin and said that an Idlib operation supported by Russia would cause an intense wave of migration and Afrin would be the first target of this wave. In such a situation, Orhan commented, the size of the pressure on Afrin would be greatly increased and, moreover, the second risk factor is the reflections of the conflicts between the Hayat Tahrir al-Sham and the National Liberation Front in Idlib on Afrin. 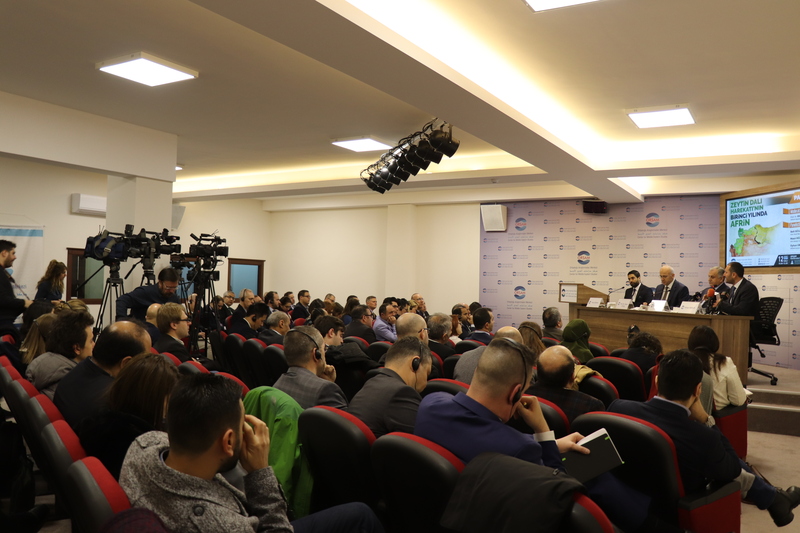 Orhan emphasized that Tell Rifaat should be under Turkey’s control for the safety of Afrin and emphasized the need for time in order to overcome the problems encountered in the rebuilding process. Taking the floor as the second speaker after Orhan, Sait Suleiman, the head of the Local Council, addressed the process of the establishment and the institutionalization of 7 local councils including Afrin district center and 6 sub-districts. Explaining that the infrastructure problems of the region that received damage as a result of the terrorist incidents were primarily taken into consideration, and that water was transferred from the Meydanki Dam in order to find a solution to the water problem of the region, Suleiman stated that there existed some works which aimed at supplying electricity in a regular manner to the region. Sait Suleiman also touched upon the steps taken towards education services. He declared that in the center of Afrin 1,500 teachers provide education services to 15 thousand students and a university will be founded in the city in the future with the help of Turkey. In addition, Suleiman stated that various arrangements had been made on issues such as population transactions, title deeds, gun licenses and license plates in order to ensure security in the region. 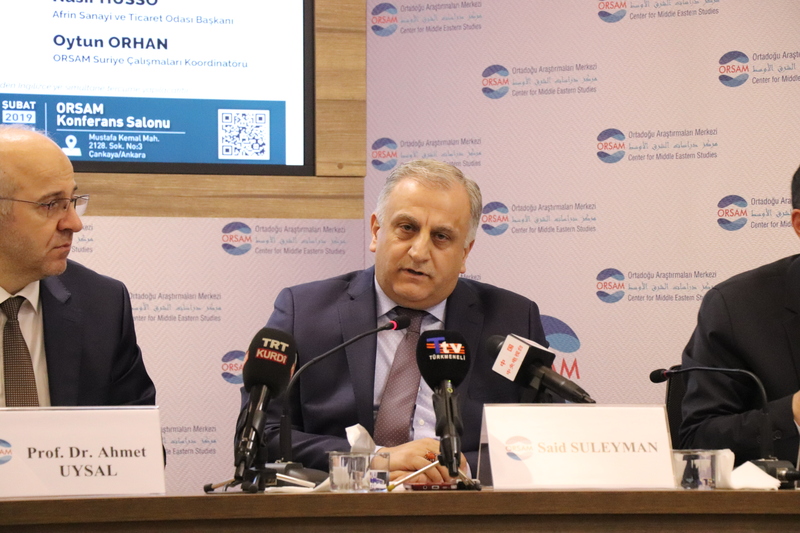 Suleiman also added that the return to normalization in political life is an urgent issue and concluded his speech by touching upon the significance of the Chamber of Commerce and Industry in the region. Last speaker, the head of Afrin Chamber of Industry and Commerce Nasir Husso, emphasized in general the importance of establishing the institutional infrastructure in the region. Stating that the security in the region is directly related to the economy, regarding the improvement of the region Nasir Husso stated that various activities were carried out in order to eliminate the economic problems of the local people. On the other hand, Husso stated that the presence of humanitarian organizations in the region is a crucial advantage while Afrin is in a better position in terms of economic cycle and resource compared to the provinces in the region. Stating that the medium-sized enterprises maintained their presence after the war and the export items such as olive oil, soap and stone coal kept alive the region's economy, Husso said the flow of money in the region was ensured and expressed the advantages of almost 150 money-transfer centers for the regional economy. In addition, he indicated that the continuation of gold and jewelry activities is an important indicator of the security provided in the region. In this context, stating that the PTT carried out the money transfer record is significant in terms of ensuring security, he said that they work in cooperation with Turkey in this subject. Nasir Husso touched upon the importance of ensuring that fuel oil was sold only at certain points and that terrorists could not benefit from them in any way along with the prevention of smuggling activities. He said that humanitarian aid activities were not required to be monopolized by certain groups and that abuse of these aids should be prevented. Pointing out the importance of the works conducted with investors and traders in the context of supporting the infrastructure projects in the region, Husso said that the per capita income in Afrin was around 150 dollars, which is much lower in the regions under regime control. Husso stated that it was aimed at reviving the commercial life in the region by developing the telecommunication infrastructure and ensuring the connection of the region with the outside. He also declared that while there was a need for funding for the normalization of the industry and trade sector, it was important to export local products to the foreign markets. Saying that the economy of the region was improving in the light of the latest data, Husso indicated that the development and progress would be faster if the international organizations provided additional support. 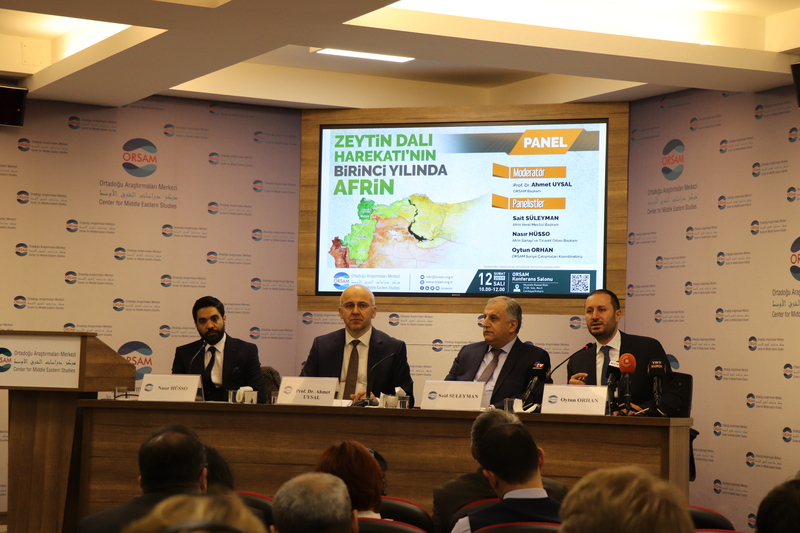 “Afrin in the First Year of the Operation of Olive Branch” Panel ended with the question-answer part. 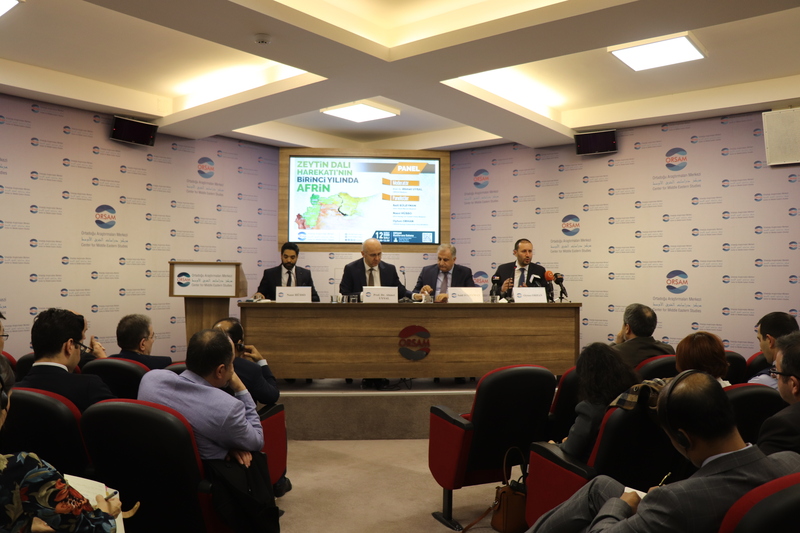 Several government agencies, embassy personnel of various countries, universities and representatives of the printed and visual media in Ankara participated in the panel. 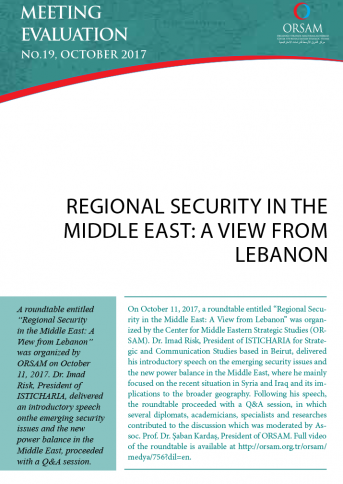 The Center for Middle Eastern Studies (ORSAM) was established in January 2009 to inform the general public and the foreign policy community on the Middle East. 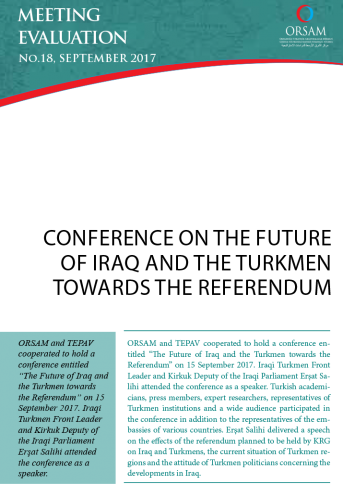 ORSAM is a nonpartisan and non-profit research center based in Ankara.